In this lesson, we will learn how to find the resultant of a system of parallel coplanar forces and how to locate its point of action. Two parallel forces F  and F  are acting at two points 𝐴 and 𝐵 respectively in a perpendicular direction on ⃖     ⃗ 𝐴 𝐵 , where 𝐴 𝐵 = 1 0 c m . Their resultant R i j = − 2 0 − 1 6 is acting at the point 𝐶 that belongs to ⃖     ⃗ 𝐴 𝐵 . Given that F i j  = − 3 0 − 2 4 , determine F  and the length of 𝐵 𝐶 . The points 𝐴 , 𝐵 , 𝐶 , 𝐷 , and 𝐸 are lying on the same straight line, where 2 𝐴 𝐵 = 𝐵 𝐶 = 3 𝐶 𝐷 = 6 𝐷 𝐸 = 6 c m . Four parallel forces of magnitudes 14, 19, 𝐹 , and 20 newtons are acting at 𝐴 , 𝐶 , 𝐷 , and 𝐸 respectively. If their resultant passes through point 𝐵 , calculate the magnitude of force 𝐹 , giving your answer in newtons. Points 𝐴 , 𝐵 , 𝐶 , 𝐷 , and 𝐸 lying in the same straight line, such that 𝐴 𝐵 = 8 c m , 𝐵 𝐶 = 1 8 c m , 𝐶 𝐷 = 1 2 c m , and 𝐷 𝐸 = 1 1 c m . Five forces of magnitudes 40, 25, 20, 45, and 50 newtons are acting as shown in the figure. Determine their resultant 𝑅 and the distance 𝑥 between its line of action and point 𝐴 . Three coplanar parallel forces having magnitudes of 6, 8, and 𝐹 newtons are acting at collinear points 𝐴 , 𝐵 , and 𝐶 respectively. 𝐴 𝐵 = 1 0 c m , and 𝐶 is not between 𝐴 and 𝐵 . The first two forces are acting in opposite directions, and the resultant of the three forces has a magnitude of 6 N, acting in the direction of the second force, with its line of action intersecting  𝐴 𝐵 at a point 𝐷 , where 𝐴 𝐷 = 6 0 c m . Find the magnitude of 𝐹 and the length of 𝐵 𝐶 .
𝐴 , 𝐵 , and 𝐶 are three points on one straight line, where 𝐴 𝐵 = 6 m , 𝐴 𝐶 = 9 m , and 𝐵 ∈ 𝐴 𝐶 . Forces of magnitudes 2 N and 2 N are acting vertically downwards at the two points 𝐴 and 𝐶 , respectively, and a force having a magnitude of 7 N is acting vertically upwards at the point 𝐵 . Find the magnitude and direction of the resultant 𝑅 and the distance 𝑥 of its point of action from the point 𝐴 .
𝐴 , 𝐵 , 𝐶 , 𝐷 , and 𝐸 are five points on the same straight line, where 𝐴 𝐵 = 2 0 c m , 𝐵 𝐶 = 6 c m , 𝐶 𝐷 = 8 c m , and 𝐷 𝐸 = 5 c m . Forces of magnitudes 4, 𝐹 , and 10 newtons are acting vertically downwards at the points 𝐴 , 𝐶 , and 𝐸 respectively, and forces of magnitudes 7 and 𝐾 newtons are acting vertically upwards at 𝐵 and 𝐷 respectively. Given that the resultant of the forces is 3 N, and it is acting vertically downwards at the point 𝑁 , where 𝑁 ∈ 𝐴 𝐸 and 𝐴 𝑁 = 1 4 c m , determine the values of 𝐹 and 𝐾 . Four parallel forces of magnitudes 6, 3, 8, and 2 kg-wt are acting perpendicularly in the same direction on the points 𝐴 , 𝐵 , 𝐶 , and 𝐷 respectively. Given that the four points are on the same straight line, where 𝐴 𝐵 = 𝐵 𝐶 = 8 9 c m and 𝐶 𝐷 = 1 0 7 c m , determine the magnitude and direction of the resultant force and the distance 𝑥 between the resultant’s point of action on the straight line and 𝐴 . Parallel forces ⃑ 𝐹 1 , ⃑ 𝐹 2 , ⃑ 𝐹 3 , and ⃑ 𝐹 4 act at the points 𝐴 ( − 1 0 , 4 ) , 𝐵 ( 9 , 4 ) , 𝐶 ( − 7 , 7 ) , and 𝐷 ( − 3 , 1 ) , respectively, where the forces are in equilibrium. Given that ⃑ 𝐹 = 3 ⃑ 𝑖 + ⃑ 𝑗 1 and ‖ ‖ ⃑ 𝐹 ‖ ‖ = 2 √ 1 0 2 N, and they act in the opposite direction of ⃑ 𝐹 1 , find each of ⃑ 𝐹 2 , ⃑ 𝐹 3 , and ⃑ 𝐹 4 . A uniform rod 𝐴 𝐵 having a weight of 64 N and a length of 168 cm is resting horizontally on two identical supports at its ends. A weight of magnitude 56 N is suspended at a point on the rod that is 𝑥 cm away from 𝐴 . If the magnitude of the reaction at 𝐴 is double that at 𝐵 , determine the value of 𝑥 . A uniform rod having a weight of 35 N is resting horizontally on two supports 𝐴 and 𝐵 at its ends, where the distance between the supports is 48 cm. If a weight of magnitude 24 N is suspended at a point that is 38 cm away from 𝐴 , determine the reactions of the two supports 𝑅 𝐴 and 𝑅 𝐵 . A non-uniform rod 𝐴 𝐵 having a weight of 40 N and a length of 80 cm is suspended vertically from its midpoint by a light string, and it becomes in equilibrium in a horizontal position when a weight of magnitude 29 N is suspended from its end 𝐴 . 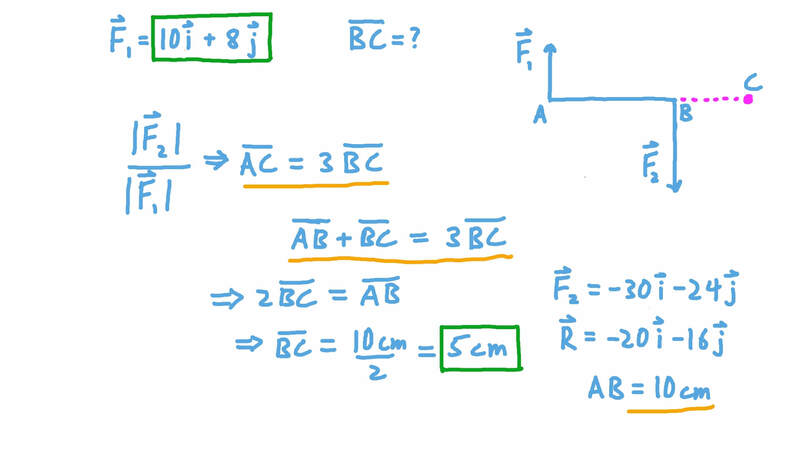 Determine the distance 𝑥 between the point at which the weight of the rod is acting and end 𝐴 . After removing the weight at 𝐴 , determine the magnitude of the vertical force that would be needed to keep the rod in equilibrium in a horizontal position when it acts at end 𝐵 . A uniform rod 𝐴 𝐵 having a length of 1.3 m and weighing 147 N is resting in a horizontal position on two supports, where the support 𝐶 is at the end 𝐴 , and 𝐷 is at a distance 𝑥 from the end 𝐵 . Find the reaction of the support 𝑅 𝐶 and the distance 𝑥 , given that 𝑅 = 2 5 𝑅 𝐶 𝐷 . A uniform rod weighs 15 N and has a length of 90 cm. It is suspended from its ends by two vertical strings, where is the tension of the string at , and is the tension of the string at . A weight of 14 N is suspended from the rod, 30 cm away from , and a weight of 27 N and is suspended from the rod, 30 cm away from . Determine the values of and . 𝐴 𝐵 is a uniform rod having a length of 111 cm and weighing 78 N. The rod is suspended horizontally from its ends 𝐴 and 𝐵 by two vertical strings. Given that a weight of 111 N is suspended 𝑥 cm away from the end 𝐴 so that the tension at 𝐴 is twice that at 𝐵 , determine the tension at 𝐵 and the value of 𝑥 .
𝐴 𝐵 is a uniform rod having a length of 78 cm and weighing 155 N. The rod is resting horizontally on two supports, 𝐴 and 𝐶 , where 𝐶 is 13 cm away from 𝐵 . Determine the minimum weight 𝑤 to be suspended at 𝐵 so that there is no pressure at 𝐴 , and find out the pressure on 𝐶 at that instant. 𝐴 𝐵 is a uniform rod with length 48 cm and weight 20 kg-wt. It rests in a horizontal position on two supports, 𝐶 and 𝐷 , that are 6 cm and 12 cm away from 𝐴 and 𝐵 , respectively. A weight of magnitude 26 kg-wt is suspended from the rod at a point 12 cm away from 𝐴 . Another weight of 16 kg-wt is suspended from the rod, 18 cm away from 𝐵 . Calculate the size of the reaction forces, 𝑅 𝐶 and 𝑅 𝐷 , at 𝐶 and 𝐷 respectively. A uniform rod 𝐴 𝐵 having a weight of 30 N and a length of 190 cm is resting horizontally on two supports 𝐶 and 𝐷 , where 𝐶 is near to 𝐵 , and 𝐷 is near to 𝐴 . If the pressure on 𝐶 is double that on 𝐷 , where the distance between them is 66 cm, determine the lengths of 𝐶 𝐵 and 𝐴 𝐷 . A uniform rod having a length of 114 cm and a weight of 66 N is suspended horizontally by means of two vertical strings at its ends. The greatest tension each string can handle is 87 N. If a weight of 76 N is to be attached to the rod, find the minimum distance at which it can be hung away from the string that has the maximum tension. The length of a rod 𝐴 𝐵 is 111 cm, and its weight is 95 newtons, which is acting at its midpoint. The rod is resting horizontally on two supports, where one of them is at end 𝐴 , and the other is at a point 𝐶 which is 30 cm away from 𝐵 . A weight of 71 newtons is suspended from the rod at a point that is 9 cm away from 𝐵 . Find the magnitude of weight 𝑤 that should be suspended from end 𝐵 so that the rod is about to rotate, and determine the value of the pressure 𝑃 exerted on 𝐶 in that situation. 𝐴 𝐵 is a uniform rod of length 93 cm and weight 35 newtons. It is suspended horizontally by two vertical strings from its two ends 𝐴 and 𝐵 . Determine the distance from 𝐴 in cm that a weight of 125 newtons should be suspended for the tension magnitude at 𝐴 to be twice its magnitude at 𝐵 . A uniform rod having a length of 56 cm and weighing 38 N is resting horizontally by means of a support and a string. Given that the support is at the end and the string is 11 cm away from the end , determine the string’s tension and the support’s reaction . 𝐴 𝐵 is a rod having a length 120 cm and weighing 12 N, which is acting at a point 15 cm away from 𝐴 . Given that the rod is resting on a support at its midpoint, determine the reaction of the support 𝑅 , and find the weight 𝑊 that should be suspended from the end 𝐵 to make the rod in equilibrium in a horizontal position. Jennifer lay on a horizontal uniform wooden plank of length 3.6 m and weight 19 kg-wt that was fixed at each end on two supports 𝐴 and 𝐵 . Given that the reactions of the two supports 𝐴 and 𝐵 are 49 kg-wt and 52 kg-wt, respectively, determine the distance between the point of action of her weight and support 𝐴 . A non-uniform wooden board 𝐴 𝐵 , having a length of 16 m, is resting horizontally on two supports at 𝐶 and 𝐷 such that 𝐴 𝐶 = 3 m and 𝐵 𝐷 = 4 m . If the maximum distance that a man, whose weight is 639 N, can move on the board from 𝐴 to 𝐵 without getting the board imbalanced is 14.2 m, and the maximum distance the same man can move from 𝐵 to 𝐴 is 14.8 m, find the weight 𝑤 of the board and the distance 𝑥 between its line of action and the point 𝐴 . A uniform iron beam having a weight of 56 N and a length of 100 cm is resting horizontally on two supports 𝐴 and 𝐵 , where 𝐴 is at the end of the beam, and 𝐵 is 44 cm away from the other end. Determine the reactions of the supports 𝑅 𝐴 and 𝑅 𝐵 .